Congestion pricing is a tax on drivers during peak demand. Typically people pay a few dollars when they drive into the center of a city. London, Singapore, Stockholm and some other major global cities have imposed congestion charges. New York and Seattle are considering it. Phil Washington, the CEO of the Los Angeles County Metropolitan Transportation Authority, says this might ease traffic. Plus, the revenues generated -- he estimates as much as $1.2 billion dollars a year -- would be applied to incentivizing mass transit use. He says the monies raised could pay for free mass transit now, and for the construction of more mass transit lines. The goal is to expedite the construction of lines already planned, but slated for completion after 2028. But LA doesn’t have a clear center, the way many older cities do! 1: “cordon pricing” - draw a boundary around downtown and charge people when they cross that line. 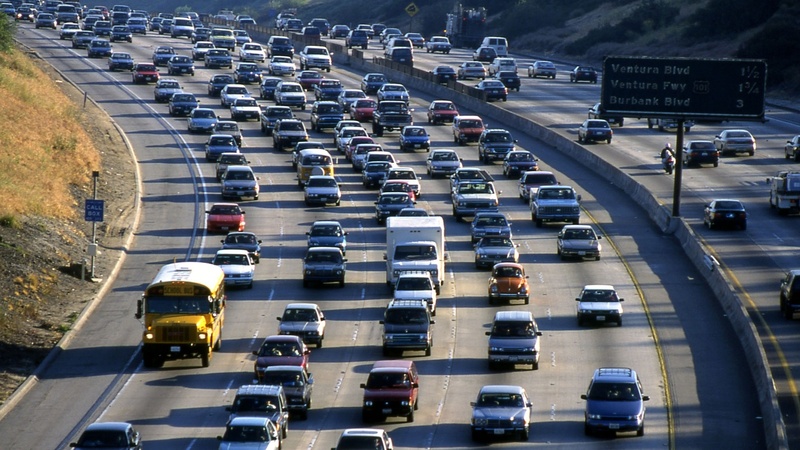 2: Vehicle Miles Traveled, or VMT - everyone is charged according to how much they drive. 3: Charge all users of major highways during rush hour, in all lanes. So everyone who takes the 10 or the 110 or 405 during peak hours would get charged. He prefers the first option, cordon pricing, and says this is ultimately the best approach to reduce gridlock. But if people are priced out of driving, how will they get around? That’s a very important point. Congestion pricing was effective at first in cities like London because London has an extensive bus and subway system. And it encourages cycling and walking. However when London Transport introduced congestion pricing 15 years ago they exempted cabs, or what they term private-hire vehicles. Then came Uber and Lyft and use of rideshare in central London soared by over 75 percent between 2013 to 2017. That of course increased the congestion and caused a reduction in people using buses because they were trapped in traffic. So now London Transport is looking at redesigning its congestion pricing policy. Phil Washington also suggested taxing ride-hailing services like Uber and Lyft. Aren’t the other cities that have tried congestion pricing denser? Yes, this is cause for concern. LA sprawls far and wide. And people often live miles from work -- especially the less affluent who tend to live the furthest from downtowns and commercial centers because that’s where housing gets cheaper. They are the very people who stand to be hit hard by a congestion tax of this kind because they drive the most. So congestion pricing could be a kind of regressive tax, targeting the people priced out of living close to work. So it becomes an equity issue. Washington’s theory is that these people will not have to drive. He acknowledges that congestion fees only work if public transit is a viable alternative, meaning free, speedy and more user-friendly. This seems politically risky and is sure to face backlash from drivers. Absolutely. Just look at the uproar over road diets in places like Playa del Rey, where a car lane was removed and it led to a recall campaign for Councilman Mike Bonin. That caused other councilmembers to squash road diet projects in their districts. Again, the reality of life in sprawling LA though is that currently mass transit doesn’t serve all areas or deliver people speedily to their destinations. It may do in 15 years -- if the 28 projects get built -- and this is an attempt to speed those projects along. So it’s a chicken and egg situation. Note by the way that LA is not giving up on this tradition of building housing further and further out -- what’s known as exurban sprawl. The LA County Board of Supervisors this week approved the Centennial project, a massive development near the Tejon Pass. That’s 70 miles from downtown L.A. Many of those residents will drive into LA for work. That’s sure to increase congestion. Didn’t voters pass Measure M in order to pay for transit projects? Yes, except Measure M doesn’t cover all the “28 by 2028” projects that Metro wants to accelerate to be ready in time for the 2028 Summer Olympics -- such as the Gold Line Eastside Extension to Whittier, South Bay Light Rail Extension and improvements to the 405 South Bay curve, currently scheduled for completion in 2047! Metro blog writer Steve Hymon has written that of the 28 projects listed, 17 are already scheduled to be complete by 2028, “eight have schedules that are “aspirational” and three would need new resources.” So funds would need to be accelerated or found for those 11 aspirational and new projects. Metro’s board will take the issue back up in January and firm up their plan in February. However, it should be noted that congestion pricing was only one of several fundraising proposals floated by Washington. Other funding options that have been floated include requesting federal money, delaying electric buses, selling naming rights to stations, asking cities to hand over their Measure M funds to Metro, or borrowing more money. All of these are politically unpalatable to different groups or individuals.